At 4 Paws Veterinary Care, we are always looking to new ways to care for your cat. Medicine and technology are constantly advancing and we embrace staying at the forefront of the best medical and surgical care. We are proud to offer laser therapy for cats at our veterinary clinic. Veterinary laser therapy provides a non-invasive, pain-free, surgery-free and drug-free treatment for a variety of conditions, and can be performed in conjunction with existing treatment protocols. Laser treatment for cats employs deep-penetrating light to promote a chain of chemical reactions known as photobiostimulation. This process helps relieve pain through the release of endorphins, and it stimulates injured cells to heal at an accelerated pace. The faster your cat heals, the better he or she feels. How Do Lasers Provide Pain Relief For Cats? Laser treatments provide pain relief for cats in three ways. First, by reducing inflammation through vasodilation (opening of blood vessels), and by activating the lymphatic drainage system, thus draining swollen areas. As a result, swelling caused by bruising or inflammation is reduced which alleviates pain. Second, by stimulating nerve cells that block pain signals from being transmitted to the brain. And third, by stimulating the production of high levels of endorphins which are pain killing compounds naturally produced by the cat. What Are The Other Benefits Of Veterinary Laser Therapy? 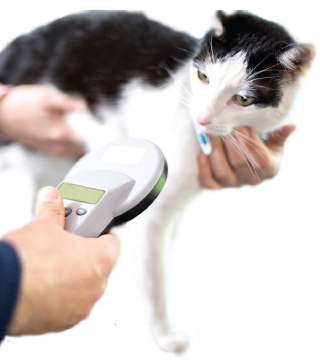 What Cat Health Conditions Can Be Treated With Laser Therapy? How Long Does A Cat Laser Therapy Treatment Take? The time needed for the treatment depends upon the condition and severity of the problem. We utilize laser therapy on incisions post operatively to aid in pain management and faster healing. These treatments are generally a one time treatment. Other one time laser therapy situations may apply to wound care of ulcerations or infections. However, with more chronic or severe pain, we will recommend a series of treatments. The treatment length will vary but most are approximately 3-8 minutes. Our veterinarians will tailor the length of the series based upon the condition and the response. For example, for chronic low back pain, we may recommend 6 weekly treatments. Some chronic conditions such as arthritis may require ongoing treatments. If your cat has responded well to the laser, we may be able to keep the pain under control with monthly treatments. Laser treatment for cats are cumulative, so each additional treatment facilitates a greater improvement in your cat's condition. One of our veterinarians would be happy to help devise a sufficient laser treatment schedule based on your cat's needs. Are There Any Side Effects Associated With Laser Treatment For Cats? Laser therapy for cats has no known side effects, and is considered both safe and effective across the veterinary industry. How Do I Schedule A Laser Therapy Appointment For My Cat? Scheduling an appointment for cat laser therapy is as easy as picking up the telephone, sending us an inquiry, or visiting our veterinary clinic in person. Our knowledgeable, compassionate veterinary team can help answer any questions you have. Make an appointment today for your cat to begin enjoying the benefits of laser therapy!